As a basketball fan, I was luckier than you. Tim Duncan was drafted by the Spurs when I was 10 years old. 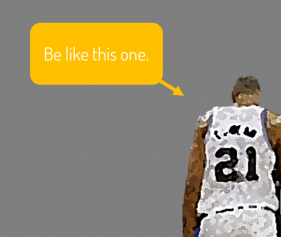 I grew up watching “The Big Fundamental” execute the crap out of every game and now he has the rings to show it. So the next game I tried my best to focus on Tim. Being fanatical about the Spurs, that is pretty hard to do – not just because the Spurs offense runs so freaking fast, but also because it is easy to miss the little things Tim does. The amount of efficiency that goes into it all is tremendous (If you watch closely, if the opponents score and he throw the ball in, he always does it leaning forward with one foot about to step onto the court as not to waste time). While it isn’t the most enlightening advice for any PR pro, the fundamentals can take you a long way – setting an agenda for meetings, starting with goals – working through the strategy THEN putting in place the tactics, having a system for entering your time. All the little things do add up, even if you don’t notice it during the workday. But around annual review period, your peers will read back your stat line to your boss, and the right people will see the double-double you put in every game.